From 2014/06/02 13:00 (JST) for 4 hours, a maintenance will be held. Tnak you for your understanding. The maintenance needs 1 more hour. Still Waiting for Google Play’s synchronization. The above issue has not been solved yet. A problem that the application on Android version 3.0 and less crashes when it recieved a Twitter comment is fixed. (*) Currently, “TV Friends” supports 100 channels by 6 time zones (i.e. there are 600 chat rooms) which is listed a major TV Guide web site. More to come later. From 2014/05/19 13:00 (JST) for 4 hours, a maintenance will be held. Tnak you for your understanding. 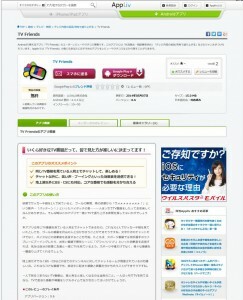 TV Friends’ page is here.